The accidentally discovered galaxy Bedin 1. 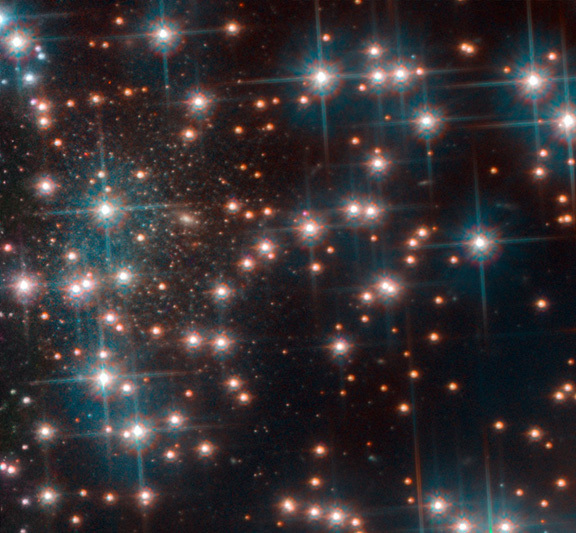 Image credit: NASA, ESA, Bedin et al.An international team of astronomers, including Professor Pierre Bergeron from Université de Montréal and member of the Centre for Research in Astrophysics of Quebec (CRAQ), recently used the NASA/ESA Hubble Space Telescope to study white dwarf stars within the globular cluster NGC 6752. The aim of their observations was to use these stars to measure the age of the globular cluster but, in the process, they made an unexpected discovery. While dwarf spheroidal galaxies are not uncommon, Bedin 1 has some notable features. Not only is it one of just a few dwarf spheroidals that have a well-established distance, but it is also extremely isolated. It lies about 30 million light-years from the Milky Way and 2 million light-years from the nearest plausible large galaxy host, NGC 6744. This makes it possibly the most isolated small dwarf galaxy discovered to date. The results were presented in the letter “The HST Large Programme on NGC 6752. I. Serendipitous discovery of a dwarf galaxy in background”, published in the journal Monthly Notices of the Royal Astronomical Society: Letters. The international team of astronomers that carried out this study consists of L. R. Bedin (INAF-Osservatorio Astronomico di Padova, Italy), M. Salaris (Liverpool John Moores University, UK), R. M. Rich (University of California Los Angeles, USA), H. Richer (University of British Columbia), J. Anderson (Space Telescope Science Institute, USA), B. Bettoni (INAF-Osservatorio Astronomico di Padova, Italy), D. Nardiello (Università di Padova, Italy), A. P. Milone (Università di Padova, Italy), A. F. Marino (Università di Padova, Italy), M. Libralato (Space Telescope Science Institute, USA), A. Bellini (Space Telescope Science Institute, USA), A. Dieball (University of Bonn, Germany), P. Bergeron (Université de Montréal, Canada), A. J. Burgasser (University of California San Diego, USA), D. Apai (University of Arizona, USA).